Fire Equipment items to make your job as a firefighter safer in and out of the fire building. 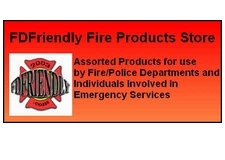 Fire Departments making the purchase can order by phone, fax or email and get 30 day terms. Individuals making the purchase are requested to use the site credit card procedure. Volume pricing may be available on select items. Call 610-584-4996 for more information. See Details on the Bail Out Kit and Tag Line Kits. Click on picture to see full page item details and product pictures.